I am in Fiji at the moment attending a Tony Robbins event called Life and Wealth Masterywhich is all about creating more health, vitality, wealth and abundance in your life. Fiji is a beautiful country! Where we are is picture perfect: groves of coconut trees, the Pacific Ocean lapping at the surrounding reef, a zillion stars in the night sky and these super cute little mongooses running around. Admittedly, the first time one ran in front of me I did almost have a heart attack, though to be fair I think so did the mongoose! We are having the best week and there have been so many magic moments, but one of best was on the first night when the local villagers came up to the conference centre to do a Meke for us. A Meke is a traditional style of Fijian dance and it was to welcome us to their island. The conference centre is located between two villages, Naidi and Valali, and both villages take turns in welcoming each new conference group. The group that comes up is normally about 40 people and their ages range from very young right through to the 60s and 70s. The Fijians wear a sulu which is a colourful piece of fabric (a bit like a sarong) that covers their bottom half and then a shirt or t-shirt to go with it. The group entered the main room singing and clapping and the energy was beautiful. They all assembled in front of us and finished their song before sitting down in a circle to sing. In Fiji a common instrument is the voice, so the circle was set up to provide the music for the rest of the dancing. The young men in the group stayed standing and then did a spectacular dance that I am guessing was about hunting based on the way they moved. 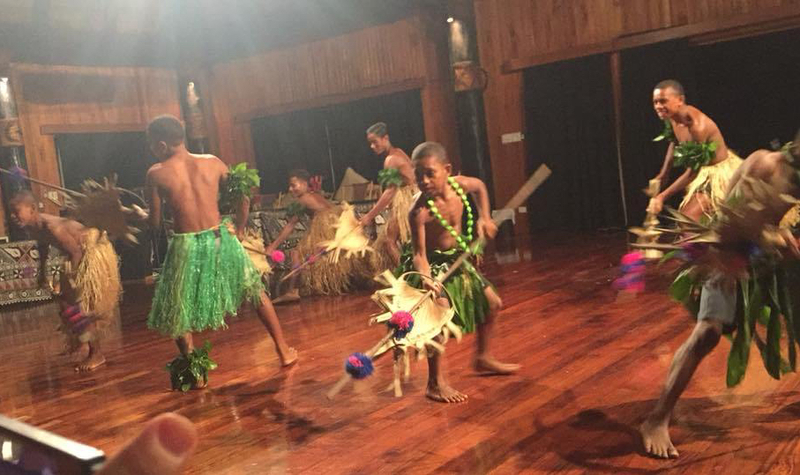 I LOVED seeing these young men (aged 10 -16) dancing and sharing their traditions so proudly with us. There was no embarrassment or shyness, they just totally owned it. I could see that this was something that brought a sense of position and place to them. This was their dance and it was a demonstration of their masculinity and place in their community. As I watched the Meke – which was about half an hour long – I had a couple of realisations. Firstly, every age group was represented here – young children right through to grandparents and I realised that we don’t see a lot of that in Australia where I am from. This was the perfect demonstration of a united and highly connected community. It wasn’t just the kids dancing or the middle-aged people, it was everyone together. That means that they must practice together. That also means that the traditions are passed down with the love and respect that they deserve. Teenagers teach the little ones, the adults teach the teenagers and the grandparents teach the adults as each group moves into the next phase of their life. This is high quality, soul-drenching, heart-filling connection! Something that so many people in my country are longing for. My second realisation was that a community that sings and dances together experiences more happiness than one that doesn’t. The Fijians are happy people and I feel strongly that this custom along with others which promote community and connection plays a huge role in that. Everyone here belongs. They say it takes a village to raise a child and seeing the Meke with the little kids surrounded by their friends, peers, parents and extended village family, I could really sense that. The Meke culminated with the Fijians asking all of the participants to get up and join in. For a moment our Western awkwardness was palpable and I could see terror in several peoples’ eyes! However it only took a few minutes before everyone was up and the floor was full of people from all over the world dancing and laughing together. Community. It is such a powerful medicine for the heart.